Snack Foods | Is it vegan? There are quite a few vegan-friendly snacks in Japan; you just need to know what to look for. For example, SoyJoy bars (not SoyJoy Crispy), while sounding promising, are not vegan as they contain egg and butter. Also, regular Oreo cookies are not vegan in Japan as they contain dairy products (aside from the question of whether the sugar was processed using bone char). So which snacks are vegan? Some of the best vegan snacks are the simple ones. In addition to the usual dried fruit and nuts, you can find roasted chestnuts and dried sweet potato in many supermarkets and convenience stores in Japan. Below are some examples of simple vegan snacks available in Japan. Some of the products below have ingredients where the source is not clear such as flavourings or emulsifiers. 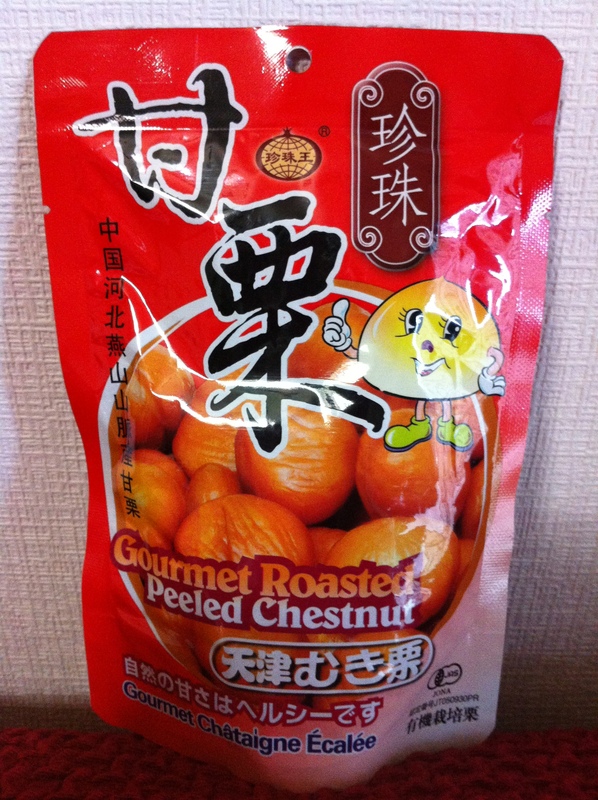 • Gourmet Roasted Peeled Chestnut. Ingredients: Organic chestnuts. These sweet potato sticks with Natural Lawson branding on the package are very filling. • Katsumata Dried Soy Beans. 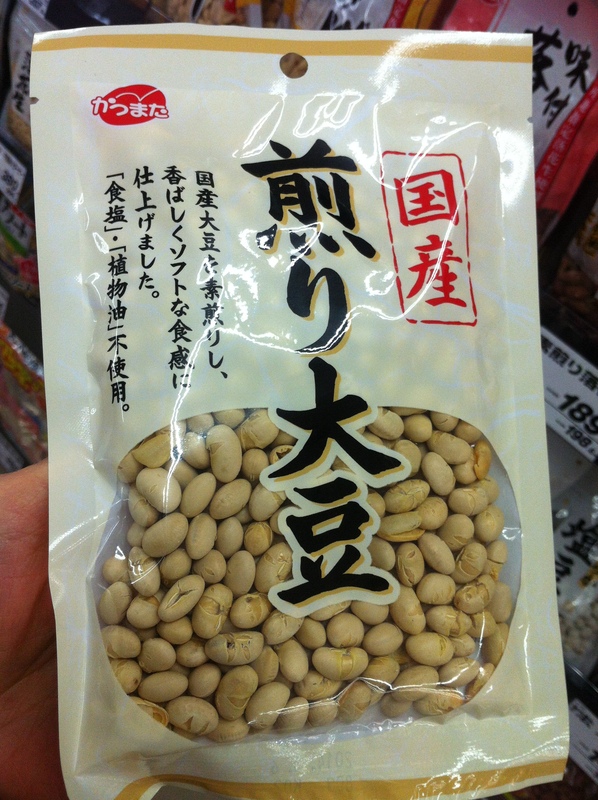 Ingredients: Soy beans (domestic)(non-genetically modified). Note: manufactured in a facility that also makes products containing egg, milk, shrimp and crab. The following product was found in the 100 yen aisle of a supermarket. • Imo kenpi／芋けんぴ. Ingredients: Sweet potatoes, vegetable oils and fats (rice oil, rapeseed oil, palm oil), sugar. 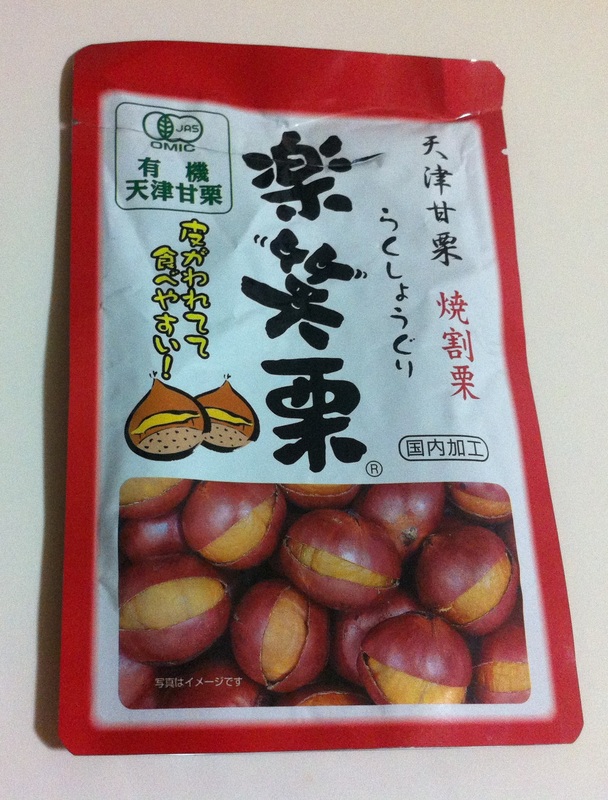 Uses domestically produced Kogane-sengan sweet potato, often used in sake brewing. Happy Dates bars have a product page here and can be ordered online here or found in selected stores (Natural Lawson convenience stores and some drugstores). The three flavors are all free of the top 27 allergenic substances. Chocolate brownie-flavoured bars with dates as the main ingredient. Milk, egg, wheat, refined sugar-free. Sweet with the flavour of roasted almonds. Uses salt from an island in Okinawa. The taste is quite chocolatey. • Happy Dates Fruit Granola/HAPPY デーツ　フルーツグラノーラ味. Ingredients: Dates, red sugar, cacao mass, granola (oats, brown rice puffs, rye flakes, isomaltooligosaccharide, malt extract, molasses), rice puffs, concentrated fruit juice (dates, raspberries), strawberries, chia seeds. Chia seeds, strawberries, and granola are all included in this date-based bar. • Happy Dates Rum Raisin/HAPPY デーツ ラムレーズン味. Ingredients: Dates, red sugar, coconut, raisins, cacao mass, rum, concentrated date juice. Rum is included in this date-based bar, making it a sweet treat for adults. 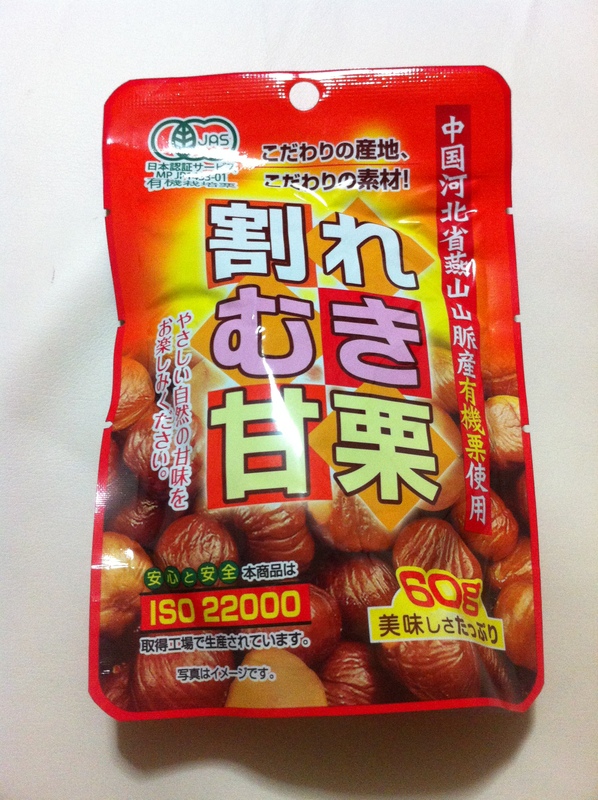 • Mujirushi Ryouhin Mixed Nuts Salt Flavor/無印良品ミックスナッツ 塩味. Ingredients: Giant corn (Peru), cashew nuts (India), almonds (U.S.A.), vegetable oil, salt, black pepper. Processed on the same equipment as items contianing wheat, dairy, and peanuts. Purabon protein balls can be found at some upscale stores, especially in large cities, and vegan festivals. The following photo was taken at Loft in Kyoto. The display says “Vegan, gluten & dairy free, no added sugar, 14% protein, all natural, source of fibre” in English. • Purabon Protein Balls/Purabon プロテインボール, Hazelnut Cacao. Ingredients: Dates, hazelnuts, peanuts, organic rice protein, organic cacao, organic coconut, organic rice puffs and sea salt. • Purabon Protein Balls/Purabon プロテインボール, Salted Caramel. Ingredients: Dates, cashews, organic rice protein, organic coconut, organic rice puffs, natural flavour and sea salt. • Purabon Protein Balls/Purabon プロテインボール, Peanut Butter. Ingredients: Dates, peanuts, organic rice protein, organic coconut, and sea salt. They can be found at many convenience stores and drugstores across Japan. MD Crunchy Fried Beni Shōga snacks may be vegan. 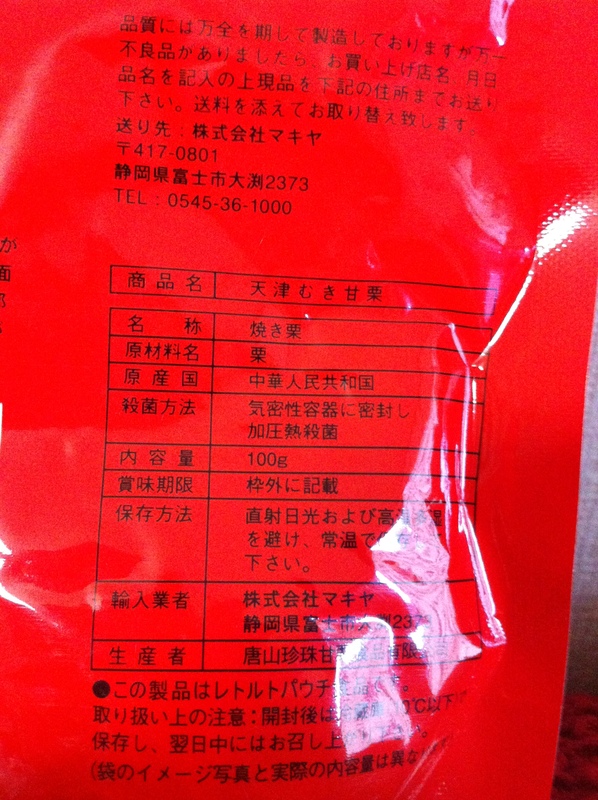 However, the source of the protein hydrolyzate is not specified as being of plant or animal origin, and the ingredient list also says その他/sono ta, other. In addition, it contains amino acids, etc. It isn’t possible to confirm if it’s vegan or not without contacting the manufacturer. • MD サクサク紅しょうが揚げ/MD Crunchy Fried Beni Shōga. Ingredients: Wheat flour, corn starch, vegetable oil (contains soybeans), ginger seasoning (ginger powder, salt, protein hydrolyzate, other), sugar, salt, ginger powder/modified starch, leavening agent, coloring (red mold-Monascus purpureus), seasoning (amino acids, etc. ), spice extract, sweetener (sucralose), tricalcium phosphate. The company voluntarily issued a recall for the Ritz Chocolate Sandwich Crackers in December, 2018 as some Ritz Cheese Sandwich Crackers accidentally got mixed up in some of the packages. 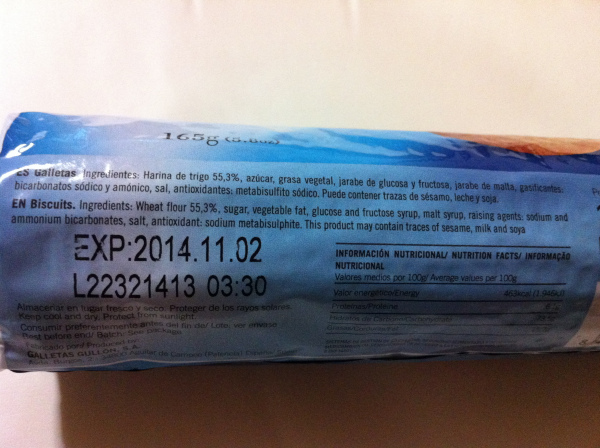 Affected products are only in the series of packages that have an expiration date 2019.06 and a code 0406 printed on the box. There’s a picture of the box here in the PDF the company issued explaining the recall (Japanese). 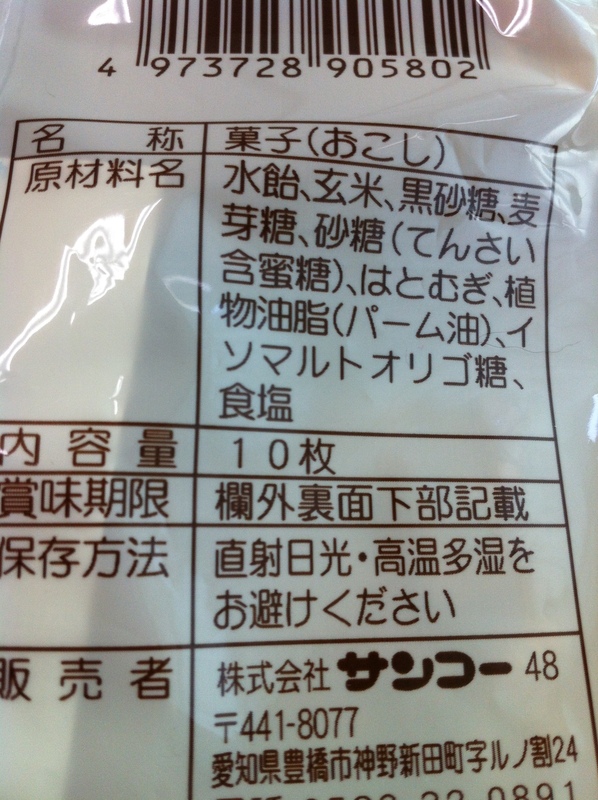 Ritz Lemon Sandwich crackers/リッツレモンサンド are not vegan as they contain whole milk powder/全粉乳 as an ingredient. Ritz Cheese Sandwich crackers/リッツチーズサンド are not vegan either as they contain whey, cheese and butter. • Amano-ya Kabuki-Age Rice Crackers/天乃屋 ひとくち歌舞伎揚. Ingredients: Non-glutinous rice (US and domestic), vegetable oil, sugar, soy sauce (contains soy and wheat), high fructose corn syrup, seasoning extract (contains soy), salt, modified starch (derived from wheat), seasoning (amino acid etc), caramel colouring. The seasoning may be animal-derived. Happy Turn Rice Crackers may be vegan, but it isn’t clear if all the hydrolyzed protein is from plants/soybeans, and the label does not state the source of the powdered fat and oil. Produced in a factory along with products containing egg, dairy, wheat, shrimp, and peanuts. They are also available in small four-packs. The ingredients and allergen warnings are the same. 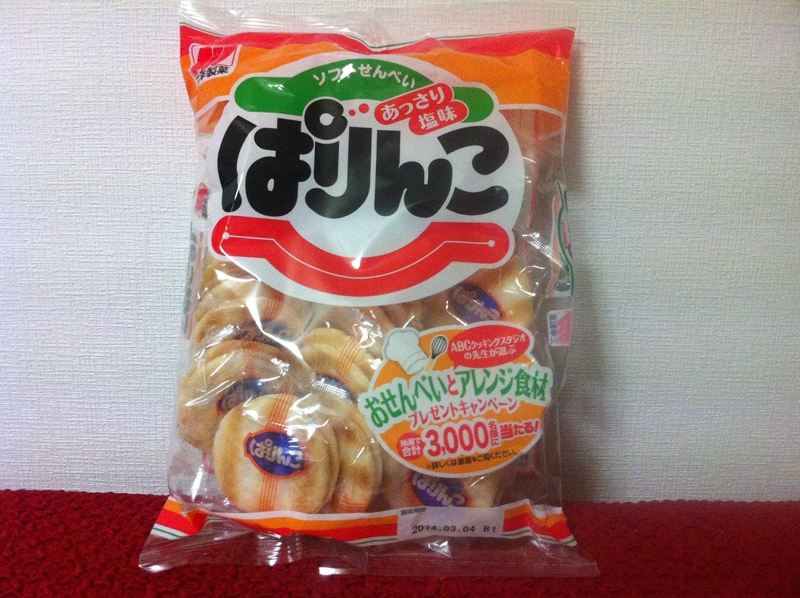 • Happy Turn Rice Crackers, 4-pack/６０ｇハッピーターンミニ4連. Manufactured in a facility that also makes products containing milk and shrimp. 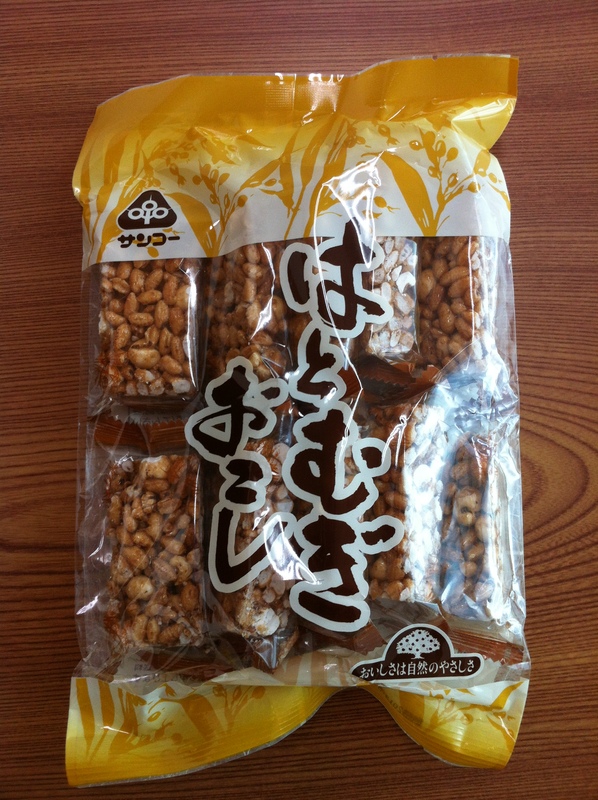 Umaibou, or “Delicious Sticks,” are extremely inexpensive snacks aimed at children. Only the salad flavour appears to possibly be vegan. However, the source of the protein hydrolyzate is not listed. It may be from soy as there is a warning that the product contains soy. It isn’t clear if the milk is part of the ingredients or if it is just a cross-contamination warning. 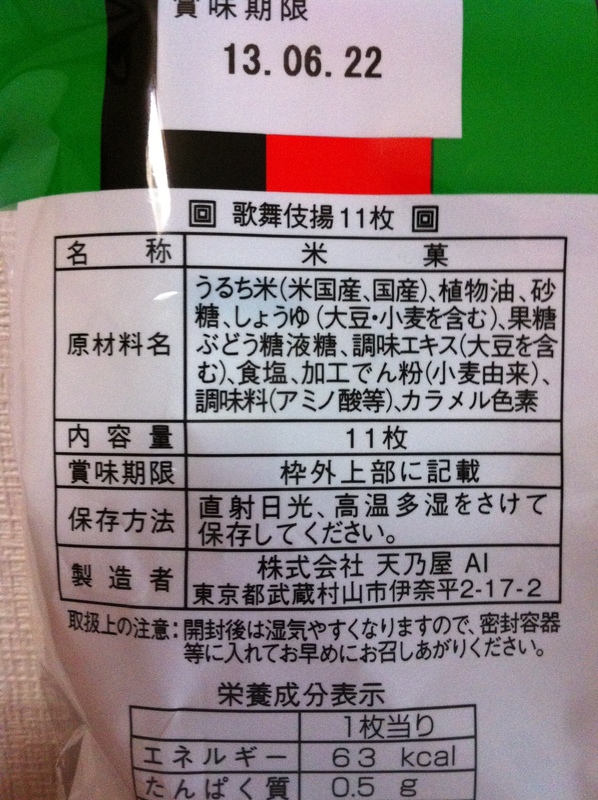 • Fukagawa Oil &Fat Company, Ltd. Lightly Salted Chemical Seasoning & Additive-free Popcorn/深川油脂工業　化学調味料無添加ポープコーンうす塩味. Ingredients: Corn (not genetically modified), vegetable oil (rice oil), salt. No chemical seasonings or preservatives are used. 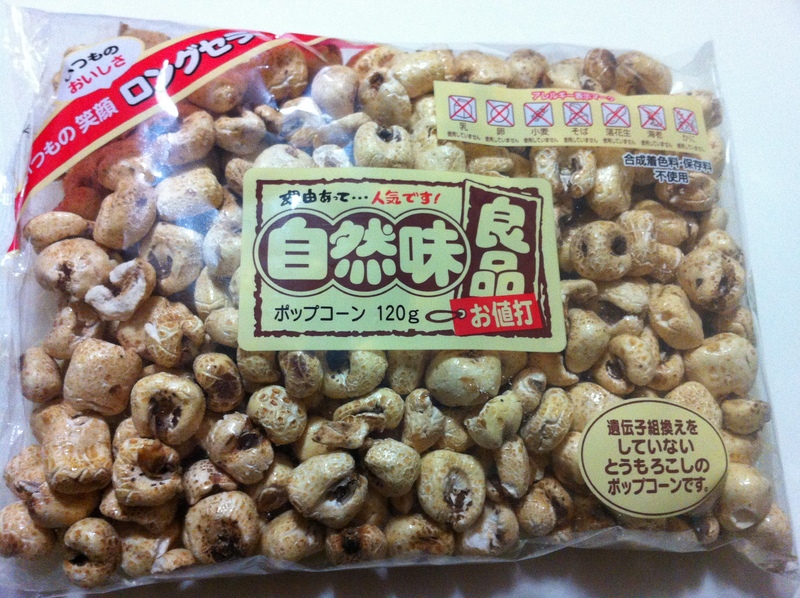 • Mujirushi Ryouhin Olive Oil Popcorn/素材を生かした　オリーブオイルポップコーン　３０ｇ. Ingredients: Popcorn, olive oil, salt. Processed on the same equipment as items containing shrimp, crab, wheat, soba, egg, dairy, peanuts. 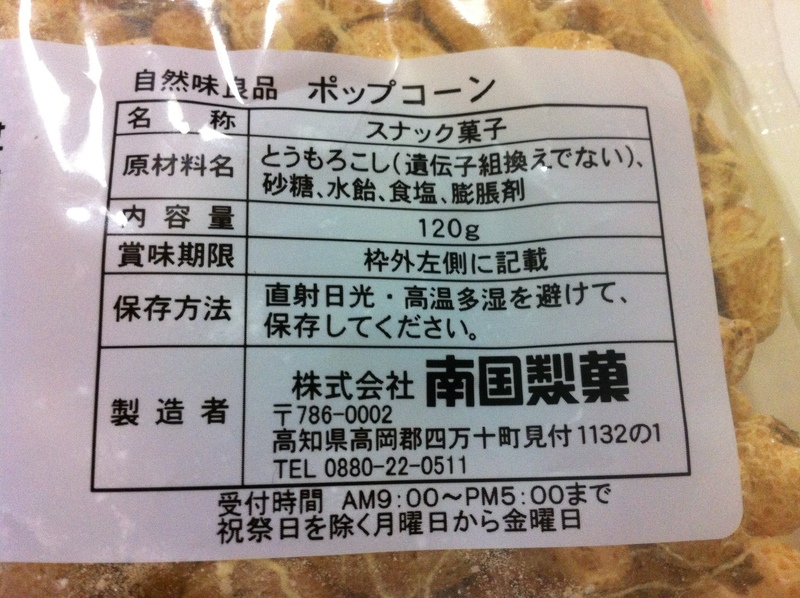 • Natural Taste Products Popcorn/自然味良品 ポップコーン. Ingredients: Corn (non-genetically modified), sugar, starch syrup, salt, leavening agent. Does not contain milk, egg, shrimp or crab. Does not use artificial colors or preservatives. 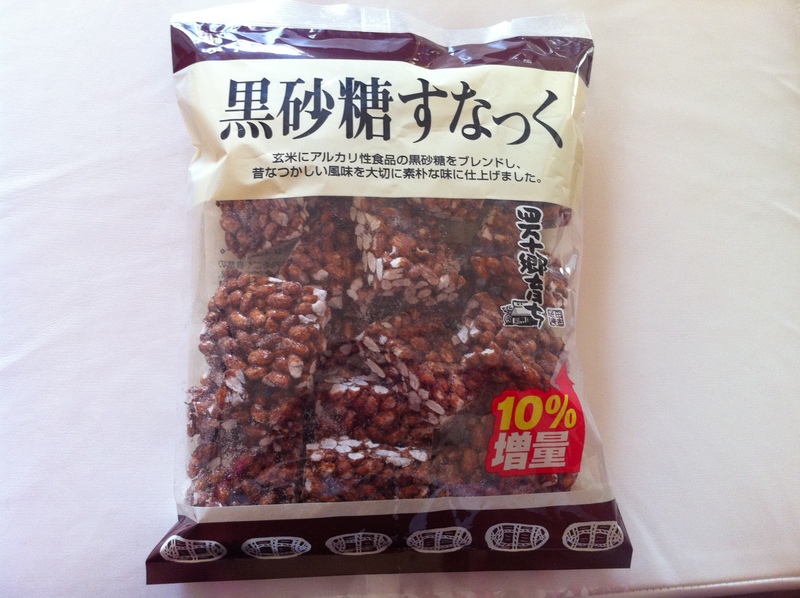 • Sanko Brown Sugar Rice Snacks/サンコー はとむぎおこし. Ingredients: Starch syrup, brown rice, brown sugar, maltose, sugar (non-centrifugal sugar beet sugar), adlay (Job’s tears), vegetable oil (palm oil), isomaltooligosaccharide, salt. 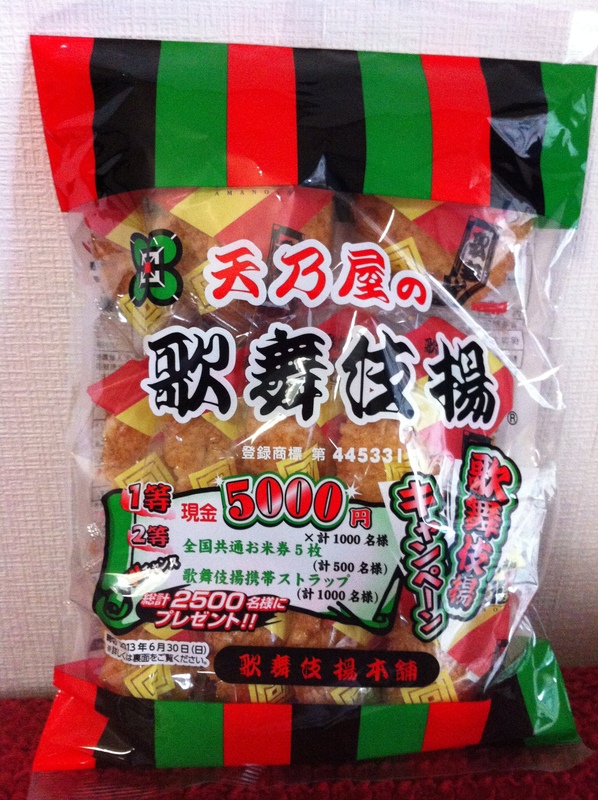 • Brown Sugar Rice Snacks/南国製菓 黒砂糖すなっく. Ingredients: Rice (domestic), sugar, starch syrup, brown sugar, caramel, vegetable oil, polysaccharide thickener. • Mannan Life Konnyaku Batake (Devil’s Tongue) Jelly, Apple/マンナンライフ　蒟蒻畑 りんご味. Ingredients: High-fructose corn syrup (domestically produced), sugar, apple juice, dextrin, spirits, konjac powder/acidulant, pH adjuster, gelling agent (polysaccharide thickener), flavour. The product has a warning on the front of the package stating it should not be given to young children or the elderly as it can present a choking hazard. This is because of the texture, which is firmer than regular jellies. • Mannan Life Konnyaku Batake (Devil’s Tongue) Jelly, Pink Grapefruit (Limited Edition Flavour)/マンナンライフ　蒟蒻畑 ピンクグレープフルーツ. Ingredients: High-fructose corn syrup (domestically produced), sugar, fruit juice (apple, pink grapefruit), spirits, dextrin, konjac powder/acidulant, pH adjuster, gelling agent (polysaccharide thickener), flavour, tomato pigment. • Mannan Life Konnyaku Batake (Devil’s Tongue) Jelly, Grape/マンナンライフ　蒟蒻畑 ぶどう. Ingredients: High-fructose corn syrup (domestically produced), sugar, fruit juice (grapes, apples), spirits, dextrin, konjac powder/acidulant, pH adjuster, gelling agent (polysaccharide thickener), flavour. • Mannan Life Konnyaku Batake (Devil’s Tongue) Jelly, Satsuma Mandarin/マンナンライフ　蒟蒻畑 温州みかん. Ingredients: High-fructose corn syrup (domestically produced), sugar, fruit juice (Satsuma mandarins, apples), dextrin, spirits, konjac powder/acidulant, pH adjuster, gelling agent (polysaccharide thickener), flavour, carotene pigment. • Mannan Life Konnyaku Batake (Devil’s Tongue) Jelly, White Peach/マンナンライフ　蒟蒻畑 白桃味. Ingredients: High-fructose corn syrup (domestically produced), sugar, peach juice, spirits, dextrin, konjac powder/acidulant, pH adjuster, gelling agent (polysaccharide thickener), flavour. 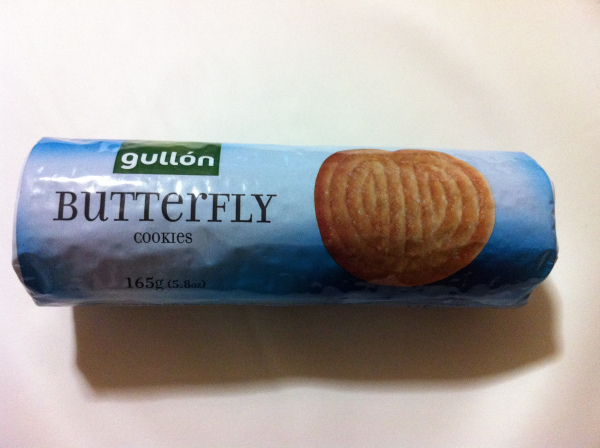 • Gullon Butterfly Cookies. Ingredients: See photo below. • Lotus Biscoff/ロータス　ビスコフ　オリジナルカラメルビスケット. Ingredients: Wheat flour, sugar, vegetable oils, candy sugar syrup, raising agent (sodium hydrogen carbonate), soya flour (not genetically modified), salt, cinnamon. (Product contains soy). The following product may be vegan, but the ingredient list doesn’t state the source of the vitamin E or flavouring. • Natural Taste Products Vanilla Cream Cracker/自然味良品 バニラクリームクラッカー. Ingredients: Wheat, sugar, vegetable oil, starch, salt, malt extract, leavening agent, flavouring, emulsifier (derived from soy), enzymes, antioxidants (BHT, vitamin E, vitamin C, citric acid). Nomura Mire Biscuits are available in a variety of flavours. The shortening is made of rapeseed oil and palm oil. It’s available in a round variety in lots of shops, but Sanrio lovers can get a whole box of a Hello Kitty-shaped variety by mail-order here (foods containing peanut, eggs, dairy, buckwheat, shrimp, sesame, and cashew nuts are made in the same factory). Or this long shelf-life Hello Kitty-shaped version in a tin can even be kept in your emergency kit in case of a disaster (processed in a factory that also handles products using eggs, milk ingredients and bananas). Foods containing peanut, eggs, dairy, buckwheat, shrimp, sesame, and cashew nuts are made in the same factory. The same product appears to be available in various different packaging. The following version of Mini Mire Biscuits was found in a health food store, and the ingredient list is a bit different. • Nomura Mini Mire Biscuits/のむら　ミニミレービスケット. Ingredients: Wheat (100% domestically produced), vegetable oil (palm oil, rice oil), sugar (brown sugar), shortening (palm oil), glucose, salt, leavening agent. There are various other flavours of this product available. Black Pepper Mire Biscuits may be vegan, but the label doesn’t say the source of the hydrolyzed protein (both animal-sourced and plant-sourced hydrolyzed protein are commonly used in Japan). Foods containing peanut, eggs, dairy, buckwheat, shrimp sesame, and cashew nuts are made in the same factory. Uses Setouchi lemon from Hiroshima and Ehime prefectures. NomuraWasabi Mire Biscuits may be vegan, but the label doesn’t say the source of the hydrolyzed protein (both animal-sourced and plant-sourced hydrolyzed protein are commonly used in Japan). Nomura Corn Potage Mire Biscuits/のむら　朝のミレービスケットコーンポタージュ味 are not vegan because they contain dairy as an ingredient. Moving on to Oreos, unlike in some other countries, Oreos in Japan have dairy as an ingredient. This also includes all the current Oreo Crispy flavours, Vanilla Mousse and Chocolate Brownie, with the exception of Mint Ice Cream. The “may contain milk products” line may be a cross-contamination warning that small particles of dairy may be present, but it isn’t clear. As Otsuka is a pharmaceutical company, they surely do animal testing, but it isn’t clear if this product was developed using animal testing. Each packet of SoyCarat is made with approximately 50 soybeans. SoyCarat provides the nutrition of soy with the enjoyment of a fun rattling sound when shaken. Calories have been kept down to approximately 120 kcal per bag as the snack is baked, not fried. 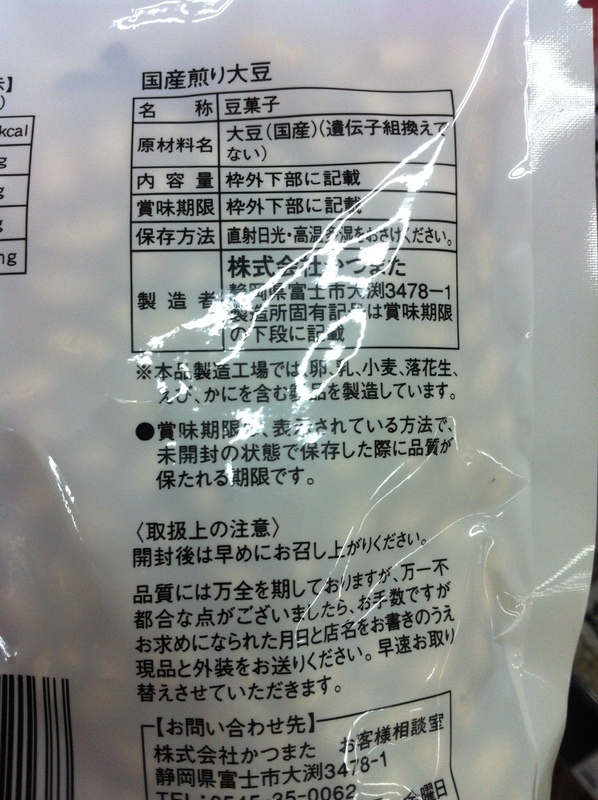 The following product was spotted at a Bio C’ Bon grocery store in Yokohama. • Crossroads Coconut Waffles, Cocoa/クロスロード　ココナッツワッフル　ココア. Ingredients: Organic flour, organic coconut milk, organic sugar, organic coconut oil, organic coconut cream, organic cocoa powder, organic agave syrup, baker’s yeast, organic coconut sugar, organic coconut (fine), sun salt, stabilizer (guar gum). • Crossroads Coconut Waffles, Plain/クロスロード　ココナッツワッフル　プレーン. Ingredients: Organic flour, organic coconut milk, organic sugar, organic coconut oil, organic coconut cream, organic agave syrup, baker’s yeast, organic coconut sugar, organic coconut (fine), sun salt, stabilizer (guar gum). Genji Pie is a snack that looks vegan but isn’t. In 2018, it was reported that the customer service center said that the margarine in the product was made out of fish, presumably fish oil.